This charging plate is made with a gold leaf and glow cast of a very precise Sri Yantra. It is inlaid with Labradorite, Lepidolite, blue Tigers Eye, Shungite and Amethyst. Smooth front and back. The Body is cast with steel shavings and 9 double terminated quartz crystals. Whatever you put on a charging disc will taste better and give you more energy. These discs work great for doing that. Simply take whatever you want to energize and place it on the disc for a short period of time ( 5 – 25 minutes ). It can make wine that has been opened for a while taste like it was new. Medications and seeds can also be enhanced after sitting on an charging disk. Water is more “structured” after resonating with charging disc, and this is great for you . Through conscious crystal programming, we can structure water to obtain maximum harmony and synergy with our bodies. 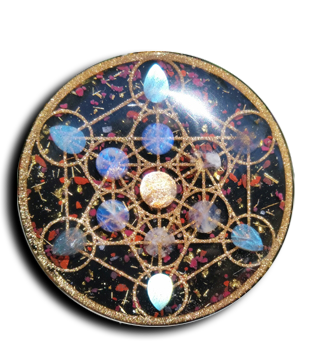 The use of orgone charging disc creates a frequency which can be modified by what type of crystal is used. The best way to transfer this energy is through spinning water over a disc so that the water molecules can get structured into a similar way the crystal is. Once the water is “changed,” it should be enjoyed as a sacred gift; the “water of life”.